Artistic, political, economic and social dogmas are on the radar of several Biennale de Montréal artists, many of whom work in Germany. Among them, Anne Imhof, who took the opportunity to present the third and final chapter of her opera, Angst. In our hyper-connected world where messages are multiplied by the second, it is hard not to think that there is always something important happening somewhere. More and more, we live in fear of missing out on what should not be missed or, worse, in fear of getting the news after the fact, even if only by a minute. Anne Imhof goes against that idea. The fact that “there is literally not much happening (…) evokes the potentiality that anything could happen at any time.,” says the 38-year-old artist, about her work mixing installation and performing arts, referring specifically to Rage, a series of performances that began in 2004. Nothing essential. Anything and very little is happening. That could be the audience’s first impression since mid-October at the Musée d’art contemporain de Montréal (MAC), where Imhof left her mark in one of the museum’s room. 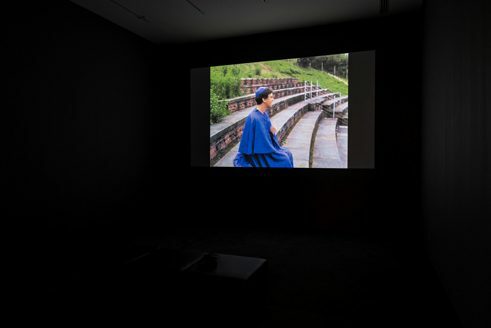 As part of the Biennale de Montréal, the artist, born in Giessen and based in Frankfurt, presented over the course of two evenings the third act of her “opera” Angst (2016). Then, in the wake of its passage, she left an installation comprised of objects, scraps and a white, but sullied, space. Among the fifty-some artists of the ninth edition of the Biennale de Montréal, a good delegation arrived from Germany, including Berlin and Frankfurt. They were eight in all, with one artist collective. From Hesse also came the guest curator, Philippe Pirotte, director of the Staatliche Hochschule für Bildende Künste Städelschule. Under the title The Grand Balcony, a nod to Jean Genet’s play The Balcony (1956), Pirotte designed a wide program based on the idea that it was possible, if not desirable, to reverse the order of things, whether social or aesthetic. For Genet, the narrative is found in a brothel, but for artists of the Biennale de Montréal, it lies in a disparity of places, times and contexts. 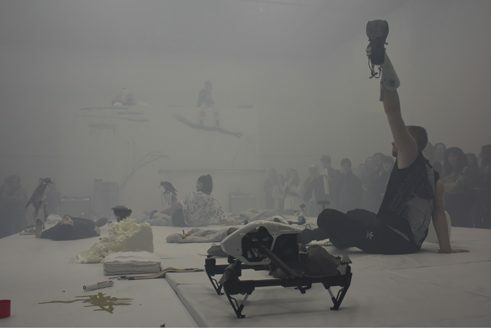 In Angst III, which was created for the Biennale with the support of the Goethe-Institut Montréal, the performance’s slow pace and length (more than four hours) are signs that artists, at least Anne Imhof, seek to challenge many aspects of life, including the audience’s role, which often remains too comfortable and complacent. “I don't consider the piece to be particularly slow or long, but I think to be slow can be a form of resistance. Speed is very subjective, however.”, believes Anne. Standing before the remains of Angst III, one could feel like they showed up too late, like they missed the party. But there are so many things to see, so many details abandoned on and around the stage that this first impression eventually fades. Beyond captivating the imagination, the Angst III-installation also suggests that elements should not be categorised by a single function or under a single definition. Painting, walking, sitting, drinking, eating, climbing, falling, rising... For almost four hours, the performers replayed the same scenes, repeated the same gestures, some enigmatic, others senseless, some visibly choreographed, others improvised. The group performed both on set and among the audience, thus pushing boundaries between reality and performance, life and its representation. Photo: Jonas Leihener ©Anne Imhof, Galerie Buchholz, Cologne/Berlin/New York and Galerie Isabella Bortolozzi, Berlin. 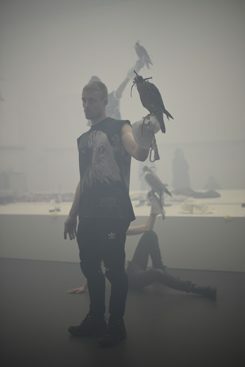 Franziska Aigner in Anne Imhof, Angst III, performed at La Biennale de Montréal, 2016. Photo: Jonas Leihener. Courtesy the artist, Galerie Buchholz, Cologne/Berlin/New York and Galerie Isabella Bortolozzi, Berlin. 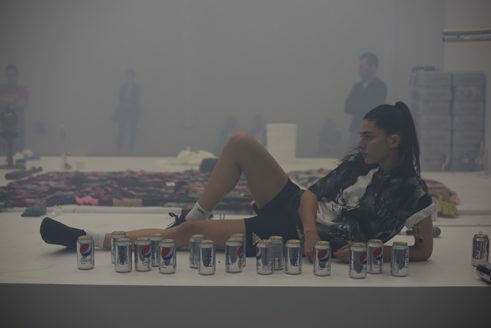 Anne Imhof, Angst III, à la Biennale de Montréal, 2016. 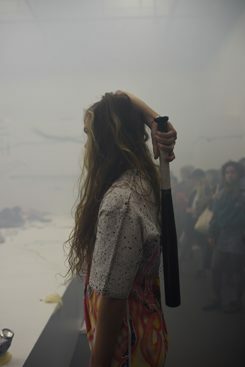 Eliza Douglas dans Anne Imhof, Angst III, à La Biennale de Montréal, 2016. 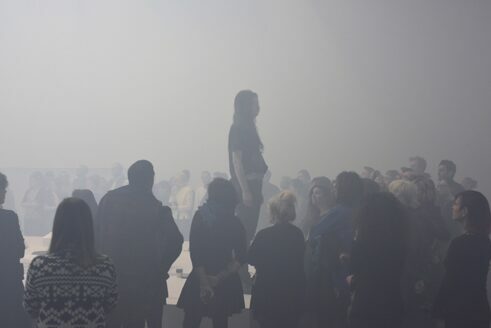 As human sculptures, dancers, and people like you and me, the protagonists progressed in a muffled world, immersed in a mist blown by fog machines. The Angst opera is a social metaphor, a portrait of an undetermined community where exchanges are coded, ritualised, and so ambivalent that they do not fit into categories. Could it be seduction, repulsion, or both? Power struggles or mutual help and sacrifice? 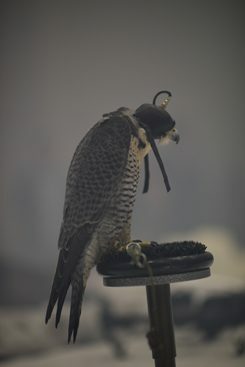 Ambiguity becomes increasingly apparent when several falcons – real falcons, with feathers and bones – take the stage. 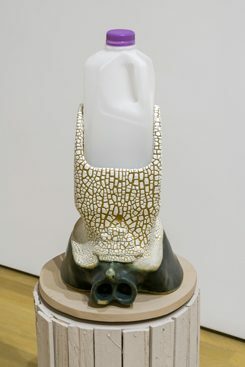 Worthy of note is the use of live animals, a feature of the artist’s practice since Aqua Leo (2013). 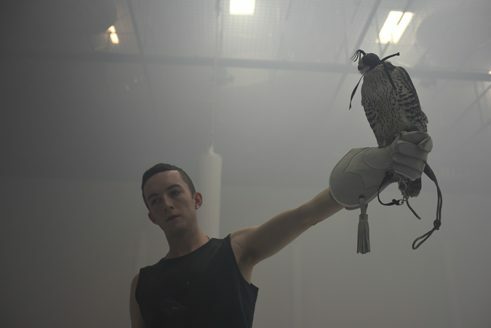 In Montreal, five falcons waited on their perch for performers to come and take care of them. Power relations are a common thread running through the Biennale, whose exhibition sites are scattered in four areas of the city. German artists expressed this theme in many ways. 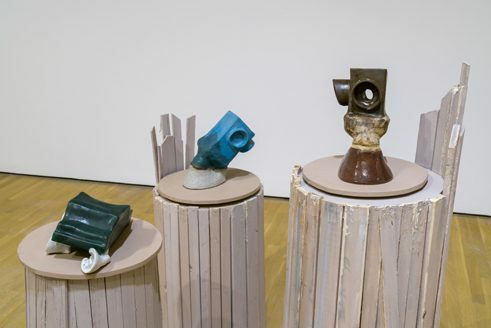 Luzie Meyer, born in Tübingen and based in Frankfurt, is the artist most closely connected to the curator’s literary source. In fact, she is the only one. 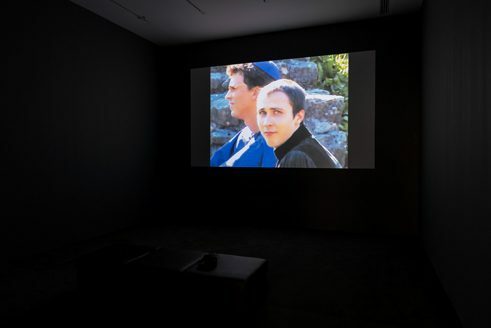 The Balcony, a video exhibited at the MAC, mirrors Jean Genet’s work. 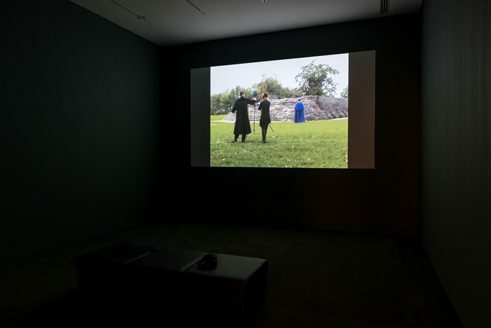 Her work however blurs the narrative thread, using sound effects, brutal editing, repetition, or scene reproduction. Meyer’s director can be compared to Genet’s prostitute moving political and social commentary to the artistic sphere. Judith Hopf, born and based in Berlin, is showing several pieces, all gathered in a room of the Galerie de l’UQAM. 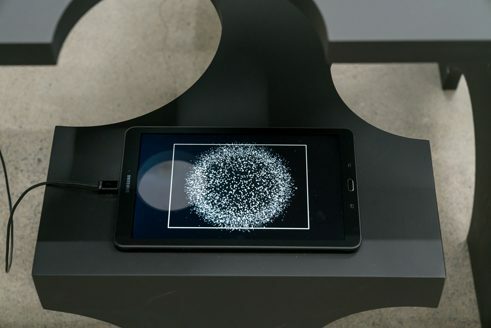 The installation consists in three short videos (1 or 3 minutes), each associated with a particular piece of furniture related to the medium (an electronic tablet, a flat screen or a smartphone). 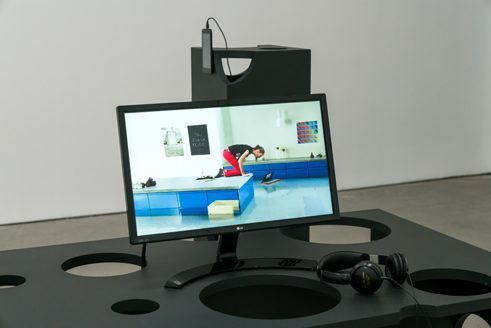 Contrary to our expectations, the so-called furniture’s titles are the ones emphasised: Untitled (Bench Sculpture), from 2016, “introduces” the More video, from 2015; Untitled (Table Sculpture), from 2016, “introduces” the Lily’s Laptop video, from 2013; Untitled (Plinth Sculpture), from 2016, “introduces” the The Evil Faerie video, from 2007. Relations of scales, hierarchies, social conventions, (beautiful) appearances… In many ways, the work of Judith Hopf shakes things up. The audience has to adapt and to adjust their position before they can even discover the screens’ content. 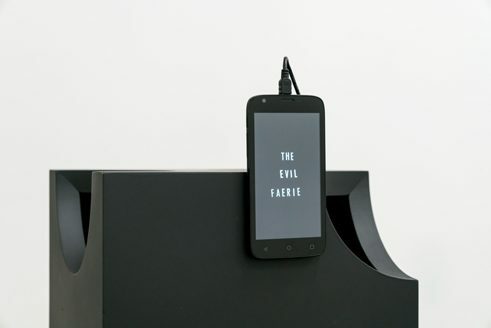 Among the three videos, Lily's Laptop is the one that best evokes the artist’s dark (but colourful) humour, and comes closest to the burlesque of the silent film era that Judith Hopf often refers to. In this video, which has sound but no dialogue, a young woman ignores the advice of the owners of a house entrusted to her and transforms the chic place into a real waterway. The artist does not claim to be waging a war against the bourgeoisie or any establishment, but she considers that being humorous in Europe, as a woman, is a battle on its own. If her work makes people laugh, so much the better, it would be a small victory. Isa Genzken, born in Bad Oldesloe and based in Berlin, has worked with a variety of mediums throughout her forty years as an artist, including painting, photography, collage, drawing and film. For the Biennale de Montréal, she is exhibiting a sculptural production from her Schauspieler series, with life-size characters calling for a disguise of identity. 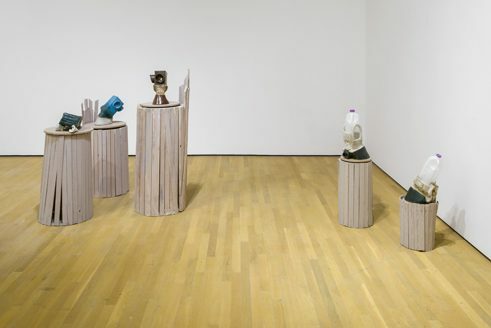 Schauspieler III, I (2015), at the MAC, comprises seven standing “mannequins” and seems more realistic than in previous versions. The mannequins form a circle, inciting us to imagine them in an inclusive but unknown ritual. Each one is dressed in disparate colours, conveying a collage of identities. Somewhere between hipster fashion and camouflage, androgyny and political manifesto, the installation fits The Grand Balcony’s theme well. Here, appearances express as much submission (towards fashion, for example) as they do wilful self-assertion and freedom. Cultural journalist based in Montreal, Jérôme Delgado has been covering the visual arts for over 15 years. He is a regular contributor for the daily newspaper Le Devoir and the film periodical Séquences. Also an occasional translator and passionate flaneur, his Guide du Montréal créatif has been published by the Éditions Ulysse in 2013. Copyright: Goethe-Institut, Jérôme Delgado. Dieser Text ist lizenziert unter einer Creative Commons Namensnennung – Keine Bearbeitungen 3.0 Deutschland Lizenz.